The Church of Scientology of Moscow marked a stellar year of service to parishioners and the community, commemorating the one-year anniversary of the dedication of their new Church on Taganskaya Street with an open house and dinner for parishioners and the community. The new Church, just a mile from Red Square, was dedicated February 26, 2011. More than 2,000 Scientologists, dignitaries and guests gathered for the grand opening, which was a milestone for Scientology in Russia. The dedication of this new Church crowned a quarter-century of growth and service to parishioners and the community, beginning in 1985 with the first hand-translated copies of L. Ron Hubbard’s Dianetics: The Modern Science of Mental Health, passed from person to person, home to home, across Moscow. A movement took root, which saw the first published Russian edition of Dianetics—released at the Kremlin Palace in March 1993—and the establishment of 40 groups and Moscow’s first Scientology Mission by 1994. Over the years, the Mission grew to a full-fledged Scientology Organization, officially founded in 2002 as the Church of Scientology of Moscow. In the months leading up to last year’s dedication, the Church nearly doubled in size. Already the premier Church in Russia, its new quarters have made it possible to provide a 400 percent increase in service to its parishioners. The new Moscow Church not only meets the needs of its growing congregation of Scientologists, but also serves as the center for all faiths to unite for community betterment and social improvement in the name of religious freedom. Moscow Scientologists carry out drug education and prevention activities every week, the Church hosts human rights and interfaith educational programs, seminars and round tables, and Moscow Volunteer Ministers help in the community and travel to disaster zones to provide relief. For a video of the grand opening of the Church of Scientology of Moscow or a virtual tour of the new Church, visit the Scientology website. The opening of the Churches of Scientology of Moscow is part of a program to build Ideal Scientology Organizations around the world—churches that fulfill L. Ron Hubbard’s vision for the religion. They not only provide the ideal facilities for religious services to Scientologists, they are also designed to serve as a home for the entire community and a meeting ground of cooperative efforts to uplift citizens of all denominations. The Church of Scientology Greater Cincinnati, dedicated February 25, was the third Ideal Organization to open in 2012, joining the Church of Scientology Sacramento, opened January 28, in California’s capital; and the Church of Scientology Hamburg, Germany, opened January 21. Other new Churches opened in recent years include Minneapolis-St. Paul, Minnesota; New York, New York; Washington, D.C.; Tampa, Florida; Nashville, Tennessee; Seattle, Washington; Las Vegas, Nevada; Los Angeles, California; Pasadena, California; Inglewood, California; as well as Québec City, Canada; Mexico City, Mexico; London, England; Melbourne, Australia; Brussels, Belgium; Madrid, Spain; Rome, Italy; Berlin, Germany. More than 10 more new Ideal Orgs are scheduled to open in 2012. 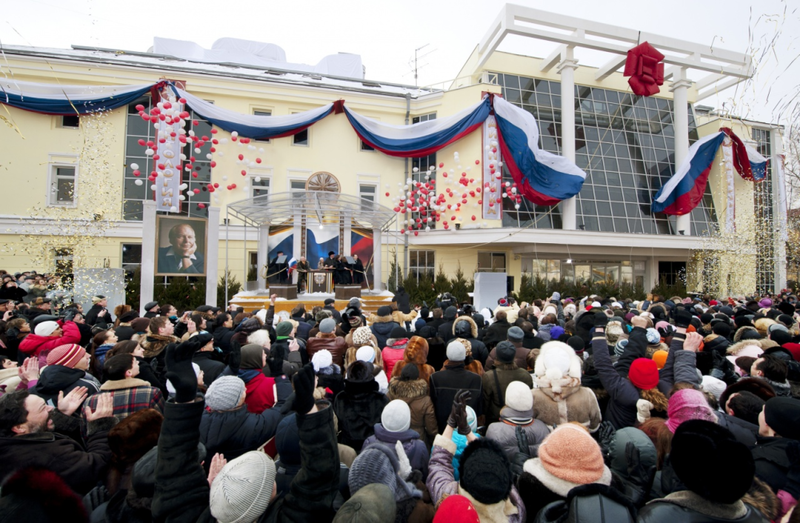 The grand opening of the Church of Scientology of Moscow, February 26, 2011.